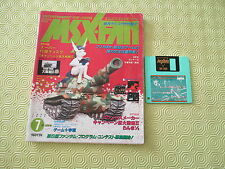 Home » Forum » MSX Talk » General discussion » Text Editor. Anyone knows were I can get a ROM or something, like a Text Editor to MSX??? I use TED, is a msxdos text editor. I used to use TOR, advanced editor made by Leonid Baraz. There's an English version in the archive at the second link Markku provided. I also saw ROM editor called "MSX-write", I can try to get image if you wish. AFAIK TED is best text editor for MSX2 and up. I always thought TED wasn't free. The copyright warning messages when you leave it seems to reinforce this. Originally TED was not free, but later they even released sources of it. But I download the SKmsx. And now a cant make it run... what is the command??? Add COMMAND.COM and MSXDOS.SYS to a disk with this file and type SKMSX when in DOS. And make sure you are in SCREEN 0 and not SCREEN 1, else it doesn't work correctly. were I can download this files?? ?